A species of tapeworm (Echinococcus multilocularis) has recently been discovered in Southern Ontario. Originating in European countries, this small (2-4 mm) parasite can be transmitted to humans and occurs in the small intestine of domestic and wild dogs, and less commonly in cats. When mature, eggs are shed in the feces then ingested by a host (such as wild rodents) the larval stage of the parasite, as a type of cyst, develops in the liver and eventually starts acting like a tumor. The worm will eventually kill the rodent. 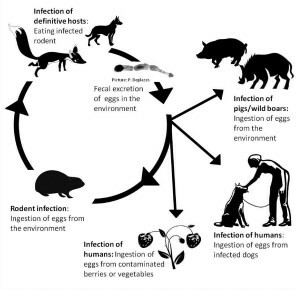 When an infected rodent is eaten by a cat or dog, it matures in the small intestine thus completing the life cycle. The parasite was found more locally and recently in multiple cases. In 2012 a 2 year old dog in Niagara was diagnosed; another case from 2012 in a 4 year old dog in Alberta/Manitoba; 3 cases between 2013 and 2015 in Brantford, Burlington and Guelph; And in 2015 two more non-human primates were diagnosed with E. multilocularis. None of the eight animals had travelled outside of Canada and therefore it likely occurred through ingestion of parasite eggs through the feces of wild dogs. Luckily no human infections have been detected with association to any of these cases. Nonetheless the occurrence of 6+ cases in Southern Ontario is of large concern as this parasite has not been diagnosed in the province prior to 2012. The main concern is that the majority of these cases had not traveled outside of southern Ontario suggesting that Echinococcus multilocularis is now a common infection in wild dogs across this region. Therefore if you own a dog it is important to be aware that parasites such as this can pose a threat to their health as well as yours. Hand washing and hygiene is the key to prevention. Speak to your Veterinarian for more information on this and other parasite protocols. This parasite has been a rising public health concern in Switzerland, France, Belgium and Germany since the late 1980’s. Surgical removal of the liver lesions and treatment with a dewormer for an indefinite period of time is the most common method to manage the parasite. Although there are few documented cases in North America in domestic pets, it has been on the rise within the last eight years. In 2009, a 3.5 year old shi tzu/bichon frise cross was admitted to a small animal hospital in BC. The small dog presented with vomiting and decreased activity level for the previous 10 days. Diagnostics revealed a large 12-13cm diameter mass in the abdomen. Exploratory surgery revealed that the mass originated in the liver and had adhered to the stomach, the spleen, and the connective tissues between the liver and stomach. It was later observed that it had multiple white fragments. What was thought to be a massive tumor was revealed to be the intermediate stage of E. multilocularis. The dog was treated with a daily dose of dewormer for life. The key finding is that this dog had never travelled outside of B.C, meaning that the infection must have been acquired within.